At LMC, the heart of our business is ownership and that ownership is valued by every LMC employee. “You see, we own the product before you do and build it as though we are building it for ourselves,” says John Kennamore, Quality Manager with over 25 years of experience in Quality Control. From the precise laser cutting of sheet metal to the meticulous paint touch-up, our products are seen by eyes and touched by hands in every area to ensure the highest quality control. Each machine must pass through a minimum of 50 quality checkpoints prior to shipment. These checkpoints include state-of-the-art computational analysis, along with inspections by highly trained quality control specialists. Our employees are engineers, technicians, and craftsmen who take pride in their work and have respect for yours. 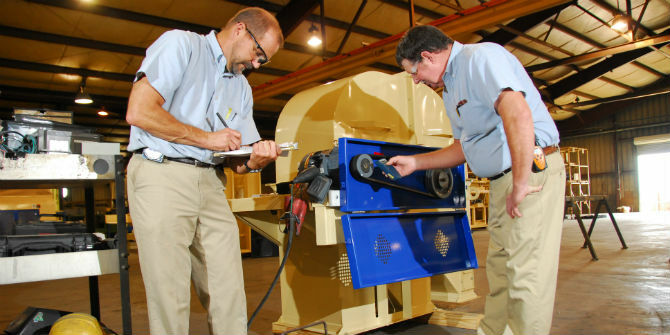 LMC can guarantee your equipment is in good hands from the blueprint to delivery. Each machine must pass through a minimum of 50 quality checkpoints prior to shipment.